As the bustling centre of the Pilbara region, Karratha is a popular destination for both business and leisure travel. 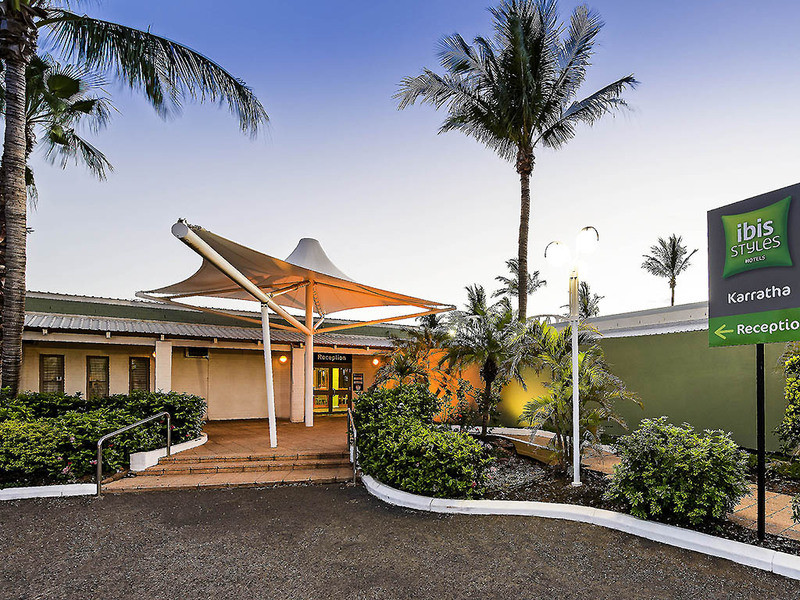 Guests staying at the centrally located ibis Styles Karratha are within easy reach of many of the Pilbara region's administration centres and government departments, as well as Karratha's CBD. Karratha boasts many lovely beaches, restaurants, shops and attractions, and is the ideal base for exploring Millstream-Chichester National Park or snorkelling the islands of the Dampier Archipelago. One night's accommodation, not bad. The room was clean and comfortable however the hotel needs some urgent attention. Rooms very well worn, the general hotel area needs attention and the shade sails over the pool are all torn. At $29 breakfast was well overpriced. was not worth $229.00. The bed was terrible to soft it sagged badly on one side. Could not get WiFi in the room. The facilities are obviously old - the rooms seem to have had an attempt at refurbishment and are acceptable. I think the biggest letdown was the gardening / maintenance etc The lawns were all well overgrown, palms were fronds everywhere, wasn't well kept;. wasn't neat and tidy by any stretch. Has the potential to be a great facility. The hotel is run down and overgrown. The laundry machines don’t work and service is hit and miss at the best of times The curtains don’t cover the windows completely The lights in the bath room don’t work properly. There is mould in the bath room and in the kitchen area. I have stayed in many ibis hotel but his one was ridiculous. I checked out a weeknearly and moved to the best western down the street. Room size is great, very clean. Location is excellent. Happy with the breakfast area, large space, food was adequate. The hotel was unable to cater for guests during our stay and it was a disappointing experience. First impressions found the rooms, bathrooms and building very old and in urgent need of refurbishment. As Tropical Cyclone Veronica approached reduced staff were unable to provide acceptable meals other than a paper bag of dry bread,chopped melon, and a take away dish of what left over food was on hand. The staff were very friendly but clearly unable to supply adequate food for the 4-days we were booked in. We were then charged full price (~ $180+) per night. I would like Accor Hotels to acknowledge my disappointment as currently I do not intend to choose Ibis Karratha Hotel for my next visit. I stayed in room 50 The Basin tap is bad. In trying to save water, the nozzle is shooting out water like a jet. My shirt is wet as the water hits the basin and splattered unto me. If I slow down the water, the tiny jets of water is not strong enough. I have not seen a hotel with a design like that to save water. Until the tap is changed to a normal tap that flows normally, I won't stay in Ibis Karratha again. The room was clean the bed was comfortable. Bathroom facilities need updating particularly the shower head. Hotel facilities and my stay were fine, no complaints. I would like to thank the team there for their flexibility and assistance with the event I had booked there - very accommodating & nothing was too much trouble. Clean, functional, great food but dated. Friendly staff, efficient check in, clean room but the decor was so 1970’s. I really enjoyed my dinner in the restaurant though. You really need to update your rooms to stay competitive. The curtains don't fully close. I did not get a good night sleep, and despite staying here numerous times in the past will not be booking again. Food was good, bathroom not clean. Easy check in & out. Bathroom has pubic hair all over it and toilet bowl was not brushed... Room service was good. I have been staying at Ibis Karratha since 2011 but I will never ever comeback. Receptionist on AM 14th and AM 15th of March 2019 is so rude. I am a shipping agent and we (myself and my colleague) have been staying at your hotel since 2011 during my visits to Karrath. Also we have been booking this hotel for our ship's crew accommodation. The check in process was very smooth and easy, the staff member was friendly. My room was old, required maintenance and the bathroom felt dirty. The shower flooded every time the shower turned on (I had to stand in a pool of water), the shower floor was dirty and also appeared rusted. The room was not inviting, with peeling paint and tired furniture. The rooms need an update and to be made 'fresh' again. The hotel is very run down and could do with a considerable face lift. Rooms very very basic but clean. I arrived on a 39 degree day to find the pool closed.